Build-A-Bear has partnered with Hasbro's My Little Pony brand to launch new plush animal toys. 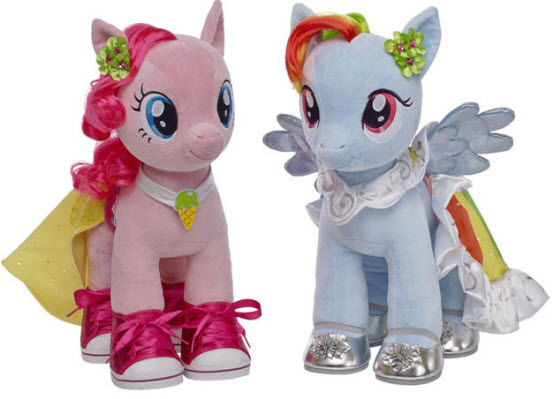 Pinkie Pie and Rainbow Dash plush toys will arrive in Build-A-Bear stores on April 1. Build-A-Bear will be holding special in-store events to celebrate the launch from April 1 to April 7. Guests are encouraged to derss up in their favorite My Little Pony fashions. The ponies will cost $24 each. Accessories for the ponies include signature capes, skirt outfits, knight costumes, theme songs, hair extensions, hairbrush and rainbow skates. These accessories range in price from $3 to $15.